Ghaziabad: IMT Ghaziabad (IMTG), marked the 3rd edition of the I’M The Change Talk, an integral part of the ‘Sustainability & Social Responsibility’ (SSR) Course, with an inspiring address on “The Next Learning Revolution” by the renowned “Change-Maker”, Shri Sonam Wangchuk, Founder, Himalayan Institute of Alternatives, Ladakh and recipient of the coveted Rolex Award for Enterprise 2016 in Hollywood, USA, on October 3, 2017. The talk was conducted alongside the ceremonial launch of the 2nd Chapter of the 3-Credit experiential learning course – SSR- under the aegis of its I’M The Change Initiative, unveiled last year on the eve of Gandhi Jayanthi. Inspired by the eternal teaching of Mahatma Gandhi, “Be the change you want to see in the world”, the primary objective of the SSR course is to expose students to situations that allow them to see how people live, especially the underprivileged, and enable students to experience the ‘joy of contribution’ through hands-on execution of live social projects with underprivileged communities. Mr Sonam Wangchuk during his address lauded IMTG’s efforts to incorporate social responsibility and sustainability in the course curriculum and expressed his delight on the spirit of ‘change’ that has touched the area of management education in India. While highlighting his unparalleled initiatives on education domain for the “underperforming” kids of Ladakh, he also stressed on the contemporary pedagogical philosophy, of “Doing” leading to “Knowing”, which has been imbibed by IMTG as well. 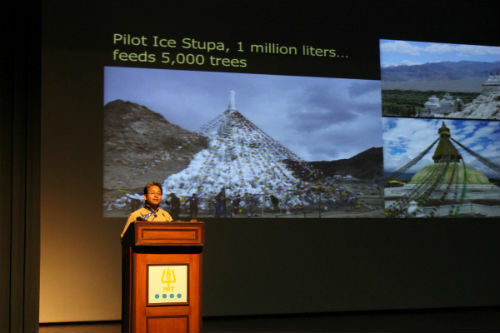 Mr Wangchuk made the audience take a walk through his path-breaking innovation on ‘Ice Stupas’ and his pioneering initiatives on water supply, with simple applications of basic principles and theories of Science. Director, IMTG, Dr Atish Chattopadhyay, addressing the audience expressed his pleasure on the completion of one year of the course. Talking more on SSR he says, “SSR projects are aimed at inculcating the eternal values of professionalism, selflessness & promoting a culture of contribution among the students”. He further added that with SSR, IMTG has embarked upon an enthralling journey intended to fathom and appreciate social contexts and challenges at the ‘bottom of the pyramid’ – people who are unlike oneself.” He further added that IMTG, as an institution must leave an impact on its graduates where they learn to live with imperfections and apparent contradiction- Graduates who can balance collaboration and competition; who can simultaneously achieve profit with a purpose; who can stand up for their integrity with courage and uphold the ‘value for values’. Dr Kasturi Das, Faculty-in-Charge, Sustainability & Social Responsibility at IMTG took the audience through the one-year journey of the course which touched the lives of an estimated 5231 people belonging to the bottom strata of the population all across Delhi-NCR. Each of the 74 social projects was aligned with one or more Sustainable Development Goals (SDGs) of the United Nations, she added. Going forward, this year 90 SSR Groups will work all across Delhi-NCR in more than 50 different categories of projects in partnership with 15 NGO partners and the Ghaziabad District Magistrate’s Office. Dr Das shared with the audience how I’M The Change within a year of its commencement has brought laurels to the institute by winning accolades and awards across various forums. Recently, in August 2017, IMTG bagged the Gold Award at ‘IMC Award for Excellence in Management Education 2017’ held in IIM Lucknow for its SSR initiative under the category ‘Developing a Future-ready Curriculum’. Earlier in July 2017, I’M The Change received accolades at the United Nations’ 2017 Global Forum for Responsible Management Education which was held in conjunction with the UN Political Forum on Sustainable Development, in New York City, USA. 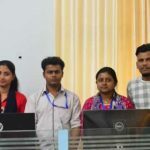 A compilation of short narratives on 10 most impactful social projects undertaken by the IMTG students has also been launched recently by IMTG, titled “I’M The Change…Parables from a Developing World”, compiled, narrated and edited by Dr Kasturi Das. The event was hosted by the Community Outreach & Social Projects (COSP) Committee, the nodal committee for SSR. Padma Shri, Mr Satish Kaura, CMD, Samtel Group & Member, Governing Council, IMTG, graced the occasion as the ‘Guest of Honour’, who was accompanied by Dr Atish Chattopadhyay, Director, IMTG; Dr Ravikesh Srivastava, Dean-Academics; and Prof Reema Khurana, PGP-Chair, IMTG, amongst others.